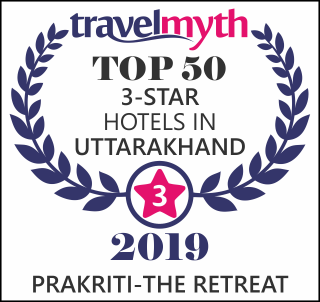 Located on NH 108, 5 kms from Harsil and 18kms en route Gangotri, Prakriti Retreat is a riverside leisure resort that aims to bring its guests close to natural beauty of the Himalayas in the Garhwal region of Uttarakhand. We started operations in May 2016. If you are looking for offbeat holiday destinations near Delhi, Harsil will not disappoint you. Proximity to Gangotri makes it a perfect stopover for rest and relaxation on your Chardhaam tour. It is also an excellent spot to acclimatize yourself on your onward treks to higher altitudes of Tapovan and Bhojwasa. Located in the midst of lush green mountains filled deodar trees and view of the snow clad upper Himalayas, Prakriti is an ideal getaway from the urban jungles. Away from the humdrum of city life and noisy hill stations, it is here that you can experience complete stillness, peace and quiet like no other place. With the soothing music of the river and refreshing crisp air, your stay at Prakriti will be one of the most memorable experiences in the hills. Prakriti brings together the best of nature and guest hospitality. On offer are 11 well equipped and pleasant double occupancy rooms from floor second to fourth. Expect all modern comforts and conveniences of a premium hotel with a touch of local flavour. Contact us to book your stay at Prakriti- The Retreat now! © 2017 Prakriti The Retreat. All Rights Reserved.